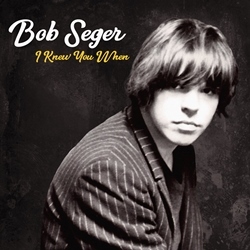 You may take it from the wistful title and the cover photo of a fresh-faced, 20-something Bob Seger staring out at you that his latest album would be a celebration of the music he grew up listening to. Instead, I Knew You When is a look backward, but more to the Detroit rocker's glory days than his inspirations. The album has the feel of past glories like Night Moves and Live Bullet, which is a pleasant surprise, particularly after the slight country-ish detour that he made on his last album Ride Out. Which is not terribly shocking, I suppose, even in his glory days Seger would sometimes go off towards country with things like "Shame on the Moon," "Turn the Page" and "Like a Rock." However, despite the churning guitars and old-school classic-rock moves of the album, this is Seger's death album � the record where he stares in the face of humanity and realizes that he is no longer a young man and suddenly he has more yesterdays than he has tomorrows. Ending the album is a bonus track, and even though it was not written specifically for the album, it is the crowning moment on Seger's album-length ode to mortality. "Glenn's Song" is a heartfelt tribute to Seger's old Detroit buddy Glenn Frey. They were in a local band together years before Seger found solo fame and Frey became a star with The Eagles. Seger wrote and recorded the song in a rush after Frey's death last year, releasing the song within weeks as a free download on his website. "Glenn's Song" is sweet, melancholy and nostalgic and shows the album off in a tone of hushed immediacy. The title track is also a tribute to Frey. "I Knew You When" has a melancholy midtempo beauty, a sweet nostalgic trip down the backstreets of memory and shared history. This is followed by the ravaged-but-beautiful ballad "I'll Remember You," a longing and sad look at his back pages. Of course, it isn't all pensive here. The thudding power chords of "The Sea Inside" feel more like something likely to come from Metallica (who famously covered Seger's "Turn the Page") than the Silver Bullet Band. Also "Runaway Train" takes on a head of steam reminiscent of early Seger tracks like "Katmandu." As is common in his later albums, Seger shows an adventurous streak in covers. Recent albums (well, in the last few, which cover about two-and-a-half decades), Seger has covered the likes of Tom Waits (four times! ), Steve Earle, John Hiatt, Jeff Tweedy, Vince Gill and Kacey Chambers. Here the covers are from two similarly revered rockers who both died in the past couple of years � Lou Reed's "Busload of Faith" (which came from New York, Reed's own mortality album) and Leonard Cohen's "Democracy" (which is more of a political polemic than a look at coming death). Actually, I'm kind of surprised he didn't choose Cohen's "Tower of Song," which would fit perfectly into the album's fascination with aging and dying, but Seger does a terrific version of the lesser-known Cohen tune, combining the original's military backbeat and capturing the author's oh-so-ironic but gorgeous word-craft with aplomb. Both songs are obviously chosen as protests of the current political climate. It is interesting to see where Bob Seger has landed, his youthful exuberance long past, but still the same surprisingly insightful rocker he has been for five decades. Copyright �2017 PopEntertainment.com. All rights reserved. Posted: November 24, 2017.